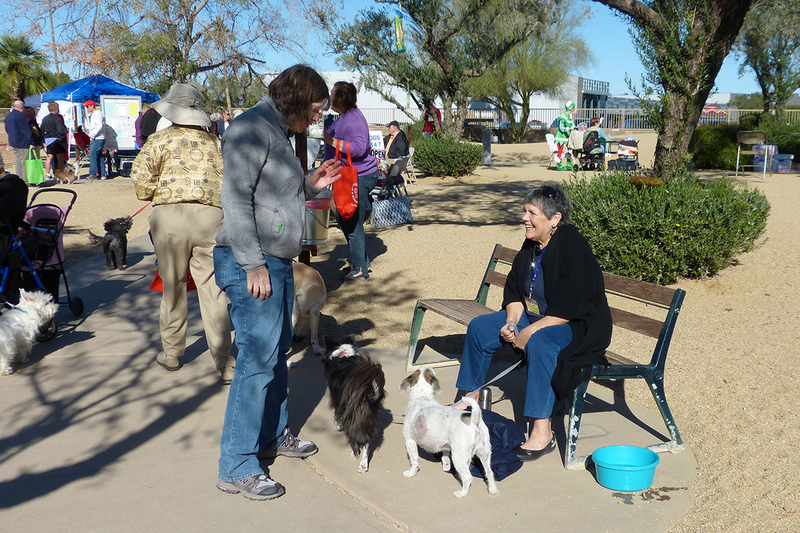 Duffeeland Dog Park - Sun City, Arizona - The Original Fun City! Click here for a listing of other area dog parks (outside of Sun City AZ) that you may want to consider for your canine’s exercise and social needs. Duffeeland Dog Park is the newest Sun City amenity. This off-leash dog park, owned and operated by RCSC, serves as a social gathering spot for dog lovers and their canine friends. This unmonitored facility is for RCSC Cardholders and their invited guests only and use of this facility is at your own risk. In order to keep the park clean and enjoyable for all users and the neighboring properties, several rules and regulations have been established. All dogs (limit 3 per owner/handler) must be vaccinated and licensed with the appropriate tags attached to a collar or harness worn at all times while in the park. No feeding of pets is allowed in the park; smoking is allowed in designated areas only (outside of the fenced area). Owners/handlers must immediately clean up after dog(s) and properly dispose of waste. It is strongly suggested that Cardholders review Board Policy 10 or the RCSC Cardholders Guide prior to visiting Duffeeland for additional requirements and restrictions. In addition, all rules and regulations are also posted at Duffeeland for your reference.